Home >> Filtration Cartridges, Inline Filters & RO Membranes >> Deionization Filters >> Water Deionization Inline Filter 2.5"x12"
The 2.5x12" inline filter housing is filled with color change De-Ionization (DI) resin by Puroflo (# WS-MBDI-CC). The DI filter contains the highest grade Gel PolyStyrene Crosslinked with DVB resin. This mixed bed (cation and anion) moist spherical bead deionization resin is ideal for ultra-pure water applications (medical, dental, aquarium, etc.). This filter is normally used after a reverse osmosis membrane to reduce enhance contaminant removal, reduce minerals and produce water with higher purity and zero (0) total dissolved solids, or conductivity values of less than 0.1 us/cm. The filter has a capacity of 250 grains (or 2500 gallons post Reverse Osmosis), an initial pressure drop of 1.5 psi at a flow rate of 0.5 gpm. It is recommended to buy TDS meter to monitor TDS in water to determine when the media is exhausted and replacement is needed. The filter housing has a cap for filling the media. The port on the cap is the inlet for water to be deionized. The media may be replaced once a year or as needed when TDS reading goes below your goal (e.g., 2 ppm). 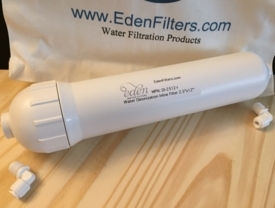 By adding this inline filter after the RO membrane, dissolved minerals left in water (say TDS is 30 mg/L) will be removed when water stream goes through this filter (say TDS is 0.1 mg/L). This inline filter can be added to the RO5-25-DI system to guarantee distilled water quality (TDS=0).